Leonhard Euler was born in Basel, Switzerland, on April 15, 1707. His father, a Calvinist clergyman, had studied mathematics with JAKOB BERNOULLI, one of nine members of a multigenerational family of distinguished mathematicians and physicists. 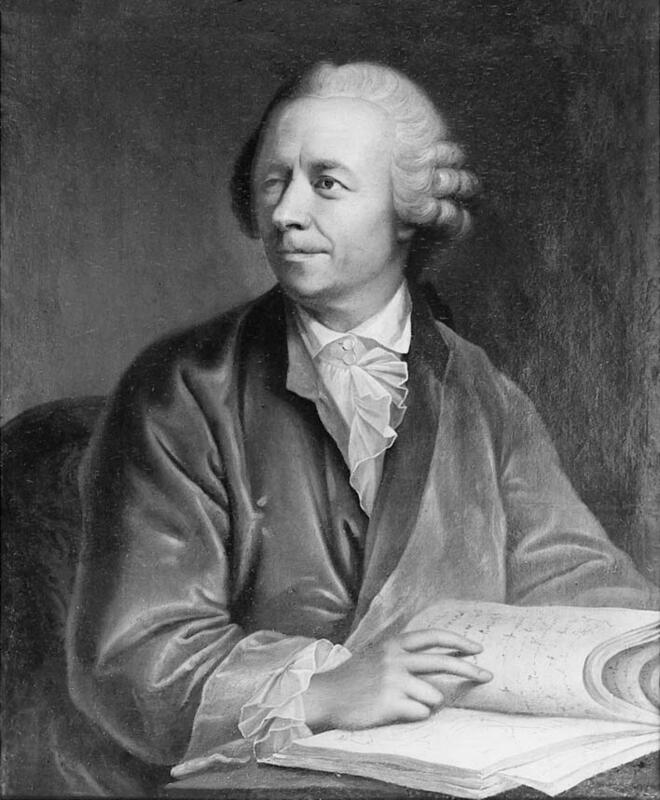 While a teenager, Euler studied mathematics at the University of Basel with Jakob’s brother, JOHANN BERNOULLI. Euler received his master’s degree when he was 17 and, with the Bernoulli family’s encouragement, he changed his career from the ministry to mathematics. Euler returned to Germany; where he was to remain for 25 years, in 1741 at the invitation of King Frederick the Great. There, he joined the Berlin Academy. In 1744 he identified the numerous solutions of polynomial algebraic equations consisting of powers of x. These algebraic solutions included whole numbers, fractions, negatives, irrationals, and complex numbers. Beyond them, however, he described transcendental numbers that are never outcomes of an algebraic equation: exponents, logarithms, trigonometric functions, etc. He also introduced standardized mathematical symbols including summation notation and e for the base of the natural logarithm. Euler contributed significantly to number theory. In particular, he solved and extended several theorems presented by sixteenth century mathematician PIERRE DE FERMAT. Euler applied mathematical techniques to the theory of lunar motion and what is called the three­body problem, which refers to an imperfect understanding of the interaction of the movement of the Sun, moon, and Earth. Using ISAAC NEWTON’s gravitational theory; Euler was able to provide an approximation for the three bodies. After 25 productive years in Germany; Euler accepted a more rewarding and lucrative position in Russia in 1766. Even though he was completely blind by then and had to rely on his students and his children to write his papers for him, he spent the last 17 years of his life thinking and composing ideas about mathematics. The more than 70 volumes of Opera Omnia contains nearly 900 smaller books and original papers. Euler worked until he died suddenly on September 18, 1783, in St. Petersburg, Russia. Euler’s legacy pervades nearly every area of mathematics—from number theory and geometry to algebra and trigonometry—and his practical application of mathematics had direct influence on navigation at sea. Evidence of the lasting effects of his originality infuse every area of mathematics. Euler’s many contributions are memorialized in mathematics texts by references to Euler’s theorem, Euler’s coefficients, Euler’s proofs, Euler’s constant, Euler’s integrals, Eulerian circuits, Euler’s transcendental functions, and Euler lines and angles. Euler’s immediate influence on mathematics extended beyond what he invented. He wrote textbooks on calculus that were used by generations of students and professionals alike. The clarity of his explanations continues to inspire and educate students of mathematics. Euler’s standardization of mathematical notations and his introduction of symbols have been adopted worldwide. Although most of Euler’s work was theoretical, some of it had practical applications. Most importantly, his application of Newton’s gravitational theory to describe mutual effects of the motion of the Sun, moon, and Earth led to lunar tables that the British Navy used to help determine latitudinal position of ships at sea.